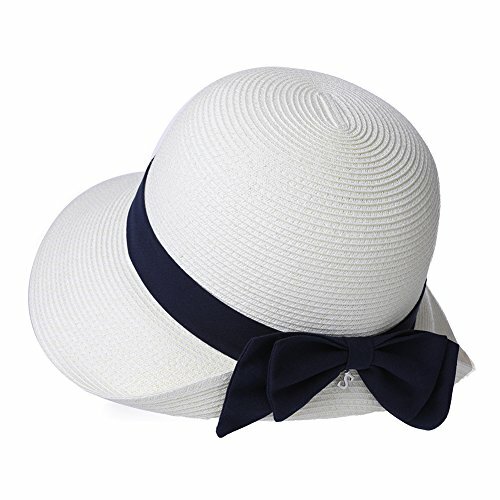 Womens Summer Foldable Straw Sun Beach Hat with Wide Brim & UV Protection - Packable & Adjustable & Breathable & Lightweight - keeps you off the sun during beach vacation, cruise, travel or hiking, gardening and boating. Hand wash with cool water; or spot clean; or wrap with a wet cloth. Foldable & Packable - you can fold or roll-up it and tuck in away in suitcase, great for cruise, beach vacation and the like. Also it can regain its shape easily, but sometimes you might need steam/ironing machine to reshape it, you can find the instruction from the product images. UPF50 - this spf rated sunhat can shade most sun UV rays, 2.8" wide brim provides excellent sun protection for face and neck in summer. Optional CHIN STRAP - the neck cord can protect your hat from flying off in wind while travelling, fishing, boating or hiking. Ventilated & Lightweight - breathable to let air flow well in, so it will not overheat in the summer. Size Adjustable - fits for 55-58CM 21.6"-22.8". With an adjustable velcro tape built inside the sweatband.